The 29-year-old Svirid made his professional debut in 2011 with a losing effort. 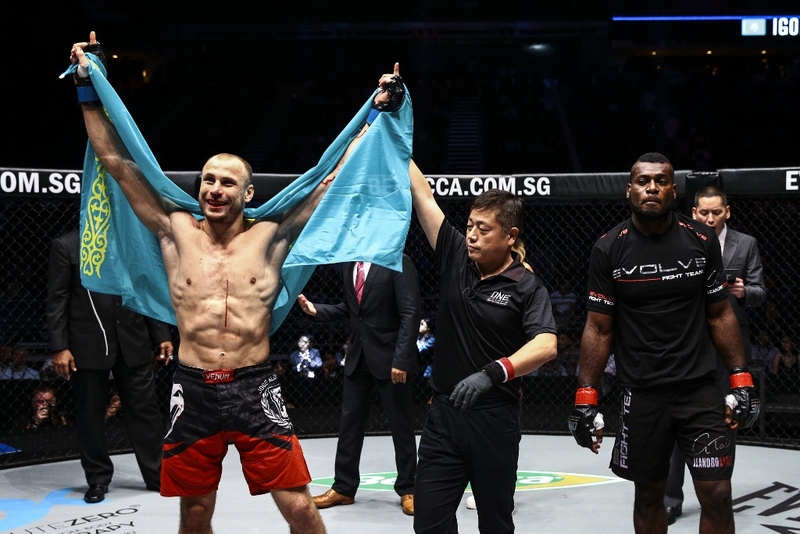 He returned to action in 2013 and put together a strong campaign of nine straight wins, including six stoppages, before fighting for the ONE Championship middleweight crown. He has faced a mixed bag of competition, with some of his opponents sporting winning records and a fair amount of experience and others having four or fewer fights and a few now sporting losing records. He tends to be a wild striker who keeps his hands low while throwing haymakers. Svirid, who has a background in combat sambo, does have strong takedowns off of catching opponents’ leg kicks. He doesn’t always make the most of his superior position, however, and struggles to maintain the position without getting swept or reversed. He proved very effective in his title bid, though. The Kazakh fighter vanquished skilled grappler Leandro Ataides in just 17 seconds, dropping the fighter with a short left hand and swarming him with punches for the finish. Bigdash, who was originally slated to meet Svirid for the title at ONE Championship 30 before the entire event was scrapped, will be making his promotional debut in the title affair. The Russian fighter debuted in 2012 and has competed primarily in his homeland, with a few stops in neighboring countries. 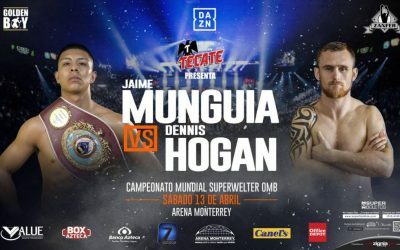 He has put together his case for a title shot with stoppage victories in all seven of his outings, including five fights under the ProFC banner. The 31-year-old has defeated some seasoned competition in his three most recent victories. He can get things done on the ground, where he has pulled off four submission victories, or end fights with his fists, as he has done in three of his appearances. The resumes of these two fighters would suggest that we’re in for an exciting battle that has a good chance of ending in a stoppage. Svirid, like Bigdash, has a well-rounded arsenal that has led to three finishes via strikes and four submission victories. Either man is quite capable of ending this fight anywhere it may go, but Svirid holds the edge on the feet and Bigdash is the superior ground fighter. Bigdash has looked out of his element on the feet in some of his fights. He’s even attempted to pull guard at times and drag his opponent to the mat. It’s a great strategy for someone who excels at creating scrambles that give him an advantageous position or a submission opportunity. The Russian loves to attack the legs of his opponents. However, he can be too willing to stay on his back, which could lead to a beatdown in fights against tough strikers who can stifle Bigdash’s sweep attempts and escape from his submission holds. Svirid utterly destroyed Ataides in their title tilt, so another grappler is a good match-up for him, as long as the fight doesn’t go to the mat. However, if Bigdash is fortunate enough to bring the fight to the canvas, the tide could turn tremendously. The champ’s power is likely to prove too much for the challenger to handle, though. It might not end quite as fast as Svirid’s last fight, but the sambo fighter should score the knockout within the first three rounds. It’s been nearly two years since MMA fans last witnessed Zoila Frausto in action. The former Bellator tournament standout was struggling through the worst stretch of her career at the time, but now she’s back at strawweight and ready to vie for gold. Her return to action comes in the form of an RFA championship bout against up-and-comer Jocelyn Jones-Lybarger at RFA 31, which also features a welterweight title tilt between champion Gilbert Smith and challenger Bristol Marunde. Frausto, who has a Muay Thai and kickboxing background, made her MMA debut in 2009. The 31-year-old “Warrior Princess” was fighting high-level opposition in Strikeforce and on the California regional scene before even logging a year as a pro. Her first loss came to current UFC women’s bantamweight contender Miesha Tate in a Strikeforce Challengers bout. After one more regional win, Frausto entered Bellator and eventually worked her way through a tournament bracket with wins over Jessica Penne, Jessica Aguilar and Megumi Fujii. The victories over Aguilar and Fujii were close and controversial split decisions, but the stretch of wins put Frausto on the map as a top strawweight. It all came crashing down, however, when Frausto tore her ACL and sat on the shelf for more than a year and a half. When she finally did return, she shifted her focus to the flyweight division, where she defeated Casey Noland before hitting a three-fight skid in which she suffered losses to Jessica Eye, Jennifer Maia and Vanessa Porto. Frausto had two submission wins and a stoppage via strikes early in her career, and she has lost by way of submission on two occasions, but she has trended toward fights that go the distance. The MMA Lab’s Jones-Lybarger has gone the distance in all but one of her six pro fights. 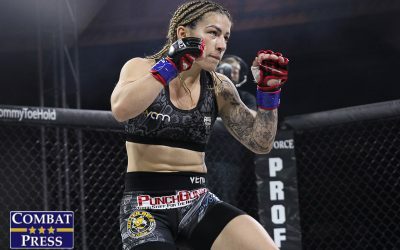 The 30-year-old made her pro debut in 2012 under the bright lights of the Invicta FC organization and emerged with a decision win over Cheryl Chan. Her next stop was King of the Cage, where she logged one win in two appearances. With a 2-1 mark, Jones-Lybarger arrived in the RFA and put together a three-fight winning streak in which she handed each of her opponents the first loss of their pro careers. Her one finish came via a 27-second guillotine choke submission in her second pro bout. Jones-Lybarger thinks Frausto is viewing her as a wrestler who won’t want to stand and bang. Well, Jones-Lybarger can definitely stand in the pocket and engage in a slugfest, but the wrestling approach might benefit her more, given Frausto’s deficiencies on the mat. Furthermore, any type of pressure in the stand-up, clinch or wrestling aspects of the fight is the key to success against Frausto. Keep her on the defensive and she tends to lose her rhythm. Frausto was beatable at 125 pounds, but far more competitive at 115. Jones-Lybarger is not going to have an easy task here, but if she looks at what Eye, Maia and Porto did right, she can definitely put together a winning strategy. Frausto’s ring rust — she has competed in kickboxing during her MMA hiatus, but kickboxing and MMA are not the same thing — could also be a contributing factor that gives Jones-Lybarger an added edge. This will be a competitive fight that goes the distance. Frausto could find her old strawweight form and pull out the victory, but this fight looks like a great chance for Jones-Lybarger to add a big win to her resume. If you listen to a UFC broadcast these days, there’s a good chance you’ll hear Mike Goldberg and Joe Rogan discuss the “Russian invasion.” Russia and surrounding nations that once made up the Soviet Union have been contributing a large amount of talent to the UFC in recent years. Ivan Buchinger, a Slovakian fighter, doesn’t exactly qualify to be part of this “invasion,” but the 33-fight veteran’s tenure as the M-1 featherweight champion certainly has put him in the spotlight of the biggest Russian promotion. He has a tough task in front of him, however. Buchinger will put his title on the line at M-1 Challenge 62, where he meets former M-1 lightweight champion Mansour Barnaoui. Buchinger has a lengthy resume that features some very familiar names. “Buki” debuted in 2008 and won his first 12 fights. His first loss came against future UFC fighter Akira Corassani. His next fight also ended in disappointment when he fell via strikes against Sengoku veteran Sergey Golyaev. 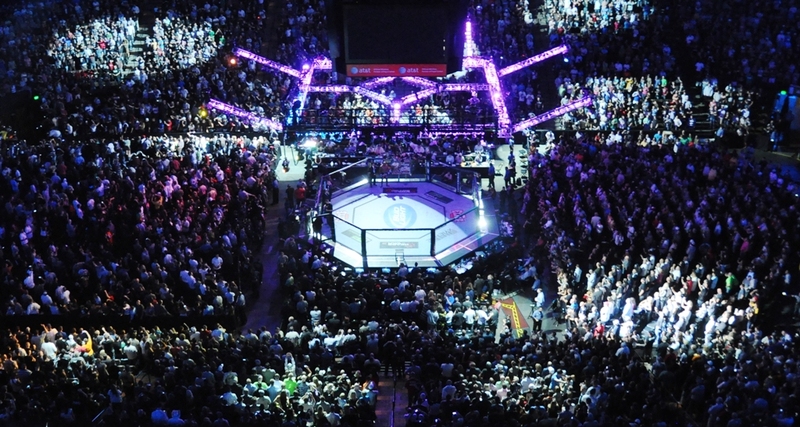 Buchinger won nine of his next 10, with the only loss coming against future UFC fighter Anton Kuivanen. Then the Octagon Fighting Academy and MMA Spirit product stepped into the Cage Warriors cage opposite Conor McGregor in a lightweight title showdown. Buchinger suffered a first-round loss to McGregor, but he has rebounded to post a perfect record through his eight subsequent outings. He has even avenged the loss to Golyaev along the way. 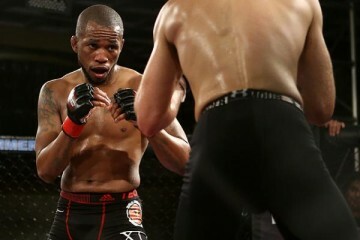 The 29-year-old captured the M-1 featherweight strap with a fourth-round finish of Tural Ragimov. Buchinger has eight wins via strikes and 16 victories via submission. He has been stopped via knockout on two occasions, but he has never been submitted. Barnaoui is a young prospect with a ton of potential. 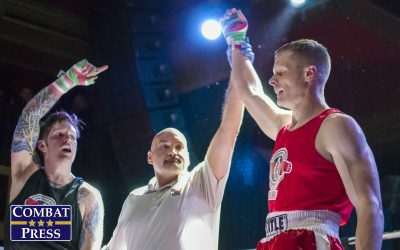 The 23-year-old won the M-1 lightweight championship in his most recent outing, stopping Maxim Divnich via strikes in the first round. The Frenchman only enjoyed his reign for a brief time before vacating the crown to move down and challenge for the featherweight title. Barnaoui followed a similar career trajectory to Buchinger. 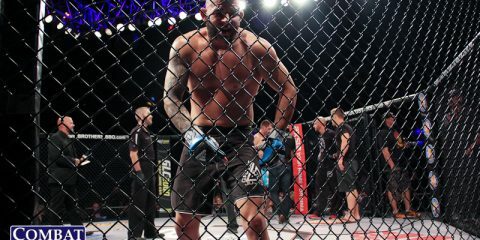 He debuted on the European regional circuit in 2011, won his first six fights and then entered Cage Warriors, where he tacked on a seventh win to his then-spotless record. 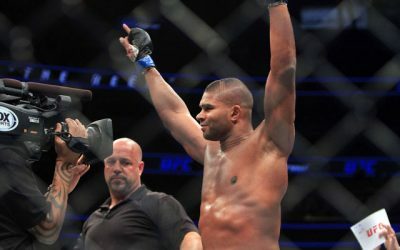 He ventured to Canada next and suffered a loss to future UFC fighter Kevin Lee. 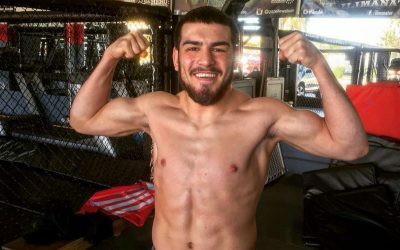 After bouncing back with a win over Ivan Musardo, the Team Magnum fighter made his first appearance under the M-1 banner and lost to Islam Makhachev, another future UFC fighter. Barnaoui rebounded with one win with the M-1 organization and two victories, over notables Curt Warburton (for the lightweight title) and Colin Fletcher, in the BAMMA cage before returning to beat Divnich for the M-1 belt. “Tarzan” has never been stopped, whereas he has dished out seven submissions and four TKOs. He trains under boxing coach Aziz Mahi, but also displays good strength and technical skills on the mat. He does not have a combat-sports background outside of MMA, and he claimed earlier in his career that he may actually spend more time skateboarding than he does training. Barnaoui might have matured beyond treating training as a secondary concern, or perhaps that was a ruse all along. Regardless, the French fighter has demonstrated the ability to defeat solid competition. Both men have struggled against UFC-caliber foes, but they have steamrolled nearly everyone else. Barnaoui needs to keep this fight on the feet, where his size — he stands three inches taller than his opponent — and superior striking skills give him the edge. Buchinger is a master on the mat, and if he can get Barnaoui to the ground, this one could end in a submission. Barnaoui has been a tough out for anyone. Even his losses came on the scorecards. Buchinger, meanwhile, has suffered a pair of knockout defeats early in fights. If Barnaoui can press the action and avoid the takedown, he could end this early. If not, Buchinger might force the young prospect to fend off submission attempts until the final bell. The French fighter has been on a roll here, and he’ll keep it going with a knockout finish of the veteran.